DENVER — Colorado is launching a major campaign to educate residents and tourists alike on how to responsibly use marijuana. The $5.7 million "Good to Know" campaign begins hitting airwaves, newspapers and the Internet this month, a year after the state legalized sales of recreational marijuana for adults. The folksy approach — banjo music underlies one of the radio spots voiced by what sounds like a rhyming cowboy — is a deliberate attempt to educate without alienating, said Dr. Larry Wolk, the state's chief medical officer and director of the Colorado Department of Public Health and Environment. While Colorado and Washington state have both previously offered limited education campaigns, the Good to Know campaign appears to be the first comprehensive effort by either state to educate consumers about the laws and regulations. Only Colorado and Washington today have recreational marijuana systems in place, although voters in Alaska and Oregon also have approved them. Voters in the District of Columbia have approved legalization but not a system of sales and taxation. "This is still uncharted territory for us, and really for everyone in the United States," Wolk said after a news conference Monday. The campaign targets teens, tourists, Latinos and even breastfeeding women, who may be unaware that THC, the part of marijuana that gets people high, can cross through the placenta, Wolk said. The campaign's funding comes from taxes paid by customers buying marijuana at the state's hundreds of legal marijuana stores. The messaging was designed by public health officials in consultation with marijuana retailers and legalization skeptics. The campaign dovetails with some of the efforts marijuana retailers have been making for months, in particular cautioning customers to be careful when consuming marijuana-infused foods known as edibles. Unlike smoked marijuana, where the effects are felt within minutes, edibles can take hours to take effect and last far longer. Smokers can easily regulate their consumption because they feel the effects fast. The state last year launched a controversial "Don't Be a Lab Rat" campaign aimed at preventing kids from using marijuana. The campaign featured human-size cages designed to look like laboratory cages for rats, along with educational materials warning about the potential for stunted brain growth. Wolk said that campaign got people talking, but was perceived by some as negative because the cages resembled jail cells. He said the new campaign is "bright and neighborly." State lawmakers ordered the campaign, along with comprehensive tracking of marijuana use and perception. Data from the first round of that survey is being analyzed, but an initial investigation found that only 27% of Coloradans realized it was illegal to smoke pot in public, and only about 23% knew that marijuana can only be sold to people 21 and older. State Rep. Jonathan Singer, a former drug and alcohol counselor, said the state's new campaign strikes an appropriate balance between education and acknowledgement that marijuana has been used safely for decades. "I've always said we need to start treating marijuana like the drug it is, not the drug some fear it to be," said Singer, a Democrat who has helped write many of the state's marijuana-legalization laws. 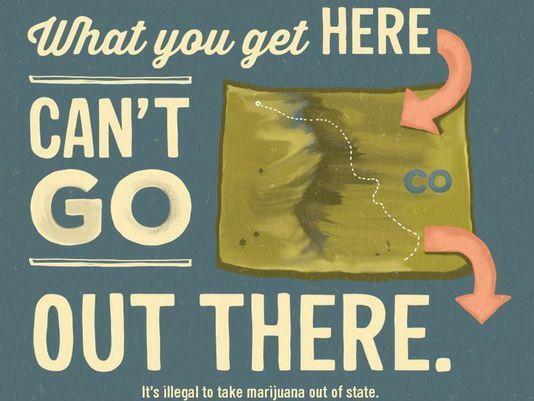 The new campaign launches just weeks after Oklahoma and Nebraska sued Colorado in the Supreme Court over the flow of marijuana into their states, and asks the court to halt Colorado's sales system because it's raising costs and arrests across the border.